The third Wednesday of the month can only mean one thing. Well, okay it could mean many things depending on your schedule but if it’s 7:30 in the VAT & Fiddle then it’s PubhD. Three researchers get 10 minutes to talk about their research followed by a 20 minute Q and A session. Opening proceedings is Alan, who is researching web-based learning resources. He is looking at how students and how tutors would create these resources, what are the differences in their methods and who produces the better output? In the past, such resources would take the form of discourse, discussion and books but we are now in the digital age. It is a disruptive technology but how will we use it? How can we create a virtual learning environment using tools such as e-mail, blogs, wikis, vlogs and podcasts? Alan is looking at creating “Re-usable Learning Objects” for use in training resuscitation techniques. There is no one book for this so instead we have people creating their own learning but what features should there be in these re-usable objects. One group of students and one group of tutors each created a storyboard for a re-useable learning object. The resources were then developed and given to junior trainee nurses. The main focus was on the creation of the storyboards. How did the students work vs how did the tutors work. The students got on with it best, they were free-flowing with more of an overall view. Meanwhile the tutors were more constrained by their own experience and pre-conceived ideas. Alan’s research has shown that students can play a key role in generating re-usable learning objects. They can help revise established knowledge due to the fact that they are engaged with the leaning process. Next up is Jess, whose research has recently been funded to the tune of €7M. She is looking at a new way of detecting cancer without having to use biopsy. However, a lot of the money has come from the US Navy as they think that the same technology could be used in their planes to protect against missiles. They are currently looking at using mid-range infrared to detect skin cancer. The idea is that if there is cancer then more blood will rush to that place, hence there will be more heat. The right wavelength vibrates skin so that you can see what it is made from and you will be able to tell the difference between healthy and non-healthy. Jess and her team are working on the optical fibres that transmit these IR beams. These are made of silicone and are only two microns thick. However, these new fibres are toxic. There are fibres that generate their own light or there is a super-continuum generator that transmits light from one end of the fibre to the other. However, making mid-IR is incredibly difficult. At the moment there is a 1KM long “mini-LHC” in Oxford that is used to generate it. It also takes three and a half weeks to make the glass fibre due to the amount of purification that is required. All in all, it’s a very expensive process. There is also an issue with the length of fibre – the longer it is, the less light comes out at the end. However, some of the molecules that are being stimulated in skin can also be found in oil. As mentioned above, the mid-IR light could also be used to scramble missile lock-ons so it’s likely that money will always be available. Finally we have Mark who is a cartographer. He is researching mapping in developing countries, specifically Tanzania. If we look at current mapping, then around one billion people have access to good quality, accurate maps such as Google Maps or the Ordinance Survey. However, the OS costs £150M per year. A country like Tanzania is the size of Western Europe and would be more costly that the OS to map. Instead of using major multinationals to create maps, how can we energise community members to makes maps. How do untrained people from slums who are on $1 a day make maps? 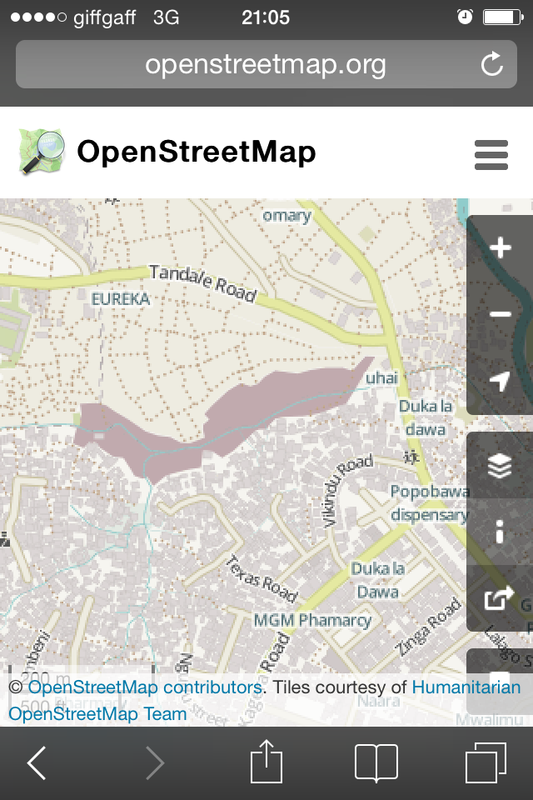 The above image of Tandali was created using community mapping. It shows that there are only 90 toilets in an area of 1.5 square kilometres. In fact the map which cost £10,000 to produce was better than one that cost $3.5M in terms of seven spatial metrics. Dar es Salaam is the fastest growing city in Africa but it is running out of space to grow. In fact it has doubled in size in the last four years. How can we create new services based on the data that we’ve collected such as access to clean water and where are the best places to put these new services. To encourage people to get involved they have to be given ownership of the data, they have to feel like they belong. Different groups have different priorities, for example in one town, the people mapped the locations of all of the trees whereas in another there are no trees on the maps at all. Tanzania is still a developing country due to the fact that they lose so many skilled people (eg due to HIV/AIDS) However, smart phones are still ubiquitous. In urban areas, ownership is around 50% and this is the main way that people map their environment. For those without phones, they are given printed out maps so that they can draw on them. Mark has said that the research that he’s been doing and the maps that have been created because of it have been influential in getting flood defences created in the right areas to save people’s lives and homes.